Dolicious donuts - Kelowna, B.C. 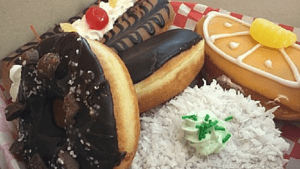 You are here: Home / Reviews / Dolicious donuts – Kelowna, B.C. 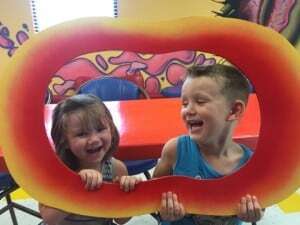 Dolicious donuts – Kelowna, B.C. Located in West Kelowna (also known as Westbank) is Dolicious. A family run business that makes their own delicious, mouth watering, dream about them all day long donuts. Flavors such as banana split, American Bismarck, Orangesicle, Coconut lime, and many others. We went in there for lunch (some of the best bread I have ever tasted) and because we couldn’t choose we bought 6 donuts and shared each one. Hands down my favorite was banana split. When you are there you can also use the various picture frames hanging on their wall and take a selfie. Tag yourself in the selfie on the Dolicious Donuts Facebook page. Live local or just visiting you can find Dolicious at 3711 Elliot Road. Open Monday-Friday 6am-7pm and Saturdays 7am-7pm.